For centuries, The Bhagawad Geeta, the immortal conversation between Lord Krishna and Arjuna-expressed as a celestial song-has been blessing the universe with its precise and poetic teachings of self-mastry. The complete Divine Song of the Lord is presented in this mp3 CD, track by track, so that listeners can choose to hear it in its entirety, by chapter or by verse. 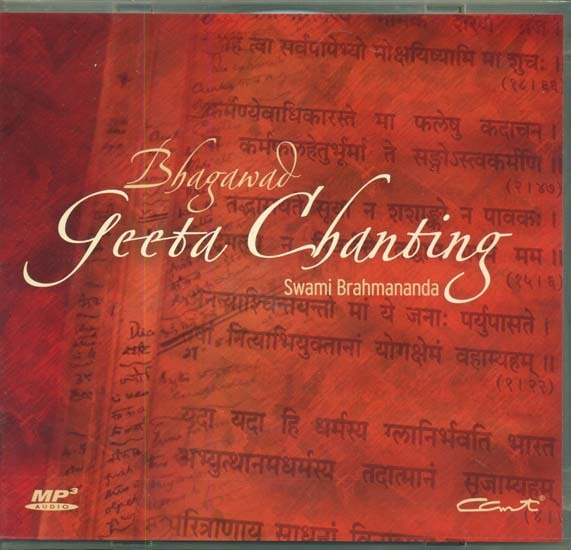 Hence, this CD would be a valuable aid in personal or group contemplation upon the Geeta. Set against simple yet elevating musical notes, the verses have been chanted in the rich and resonant voice of Swami Brahmanada. The powerful vibrations thus created would remain with seekers through the journey of self-discovery provided by reflection upon The Bhagawad Geeta. Swami Brahmananda is one of the senior most disciples of the great vedantin, Swami Chinmayananda. He is one of the most sought after spiritual teachers of Vedanta and his acclaimed devotional recordings are best sellers across the world.